On Monday, the Mexican military captured Miguel Angel Treviño Morales, leader of the Zetas, one of the major Mexican drug cartels. Treviño Morales is wanted in Mexico and the United States for charges of drug trafficking, murder, torture, kidnapping and extortion, among other crimes. Mexican armed forces made the arrest early Monday morning after a prolonged investigation, helped in part by U.S. intelligence. 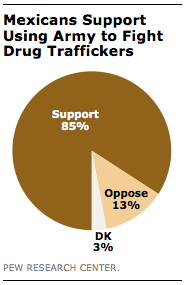 According to a Pew Research Center poll conducted in March, the Mexican public broadly supports using such tactics for pursuing drug traffickers. More than eight-in-ten favor employing the Mexican army to fight the drug cartels. Just 13% oppose. In addition, Mexicans welcome U.S. help through the training of police and military (74% support) or by providing money and weapons (55%). 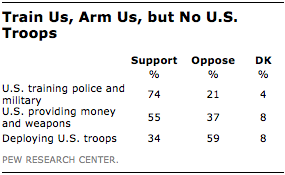 A majority (59%) opposes, however, the deployment of U.S. troops within their country to assist in the fight. The arrest of Treviño Morales is the first major blow against the drug cartels under new president Enrique Peña Nieto’s administration. During his campaign for office, Peña Nieto promised to make significant progress in the fight against drug traffickers. In the March survey conducted before Treviño Morales’s arrest, just 47% of the Mexican public approved of Peña Nieto’s handling of organized crime and drug trafficking, while 45% disapproved. But whether the big arrest will reduce drug-related violence – or improve Peña Nieto’s approval rating – is still too early to tell. Treviño Morales’s removal leaves Joaquin “El Chapo” Guzman, the leader of the Sinaloa Cartel, in a stronger position to challenge the Zeta’s dominance in Eastern Mexico. Katie Simmons is an associate director of research at Pew Research Center.